← The robots have arrived!! A weekend of two halves!! Well what a weekend. Two contrasting days at both ends of the spectrum. So let me begin at the beginning, which is usually the best place to start. Saturday was beautiful and sunny, very warm, and the perfect day to have our allotment Summer Fete. We had a BBQ, Tombola, Cake sale, Guess the weight of the Cake, and a Bric a Brac stall. Loads of plot holders came and lots of fun was had by all. A huge thank you to everyone who came and also helped set up and make the day so much fun. Then came Sunday….well, when I woke this morning the sun was not shining, in fact it was pouring with rain. This I was none to pleased about as I had planned on walking the 24 miles from my house to Nymans as part of my training for my Shine Walk in about a months time. The rain had eased by the time I left just after 9am, but I wasn’t taking any chances so borrowed Marks waterproof as mine isn’t waterproof anymore. 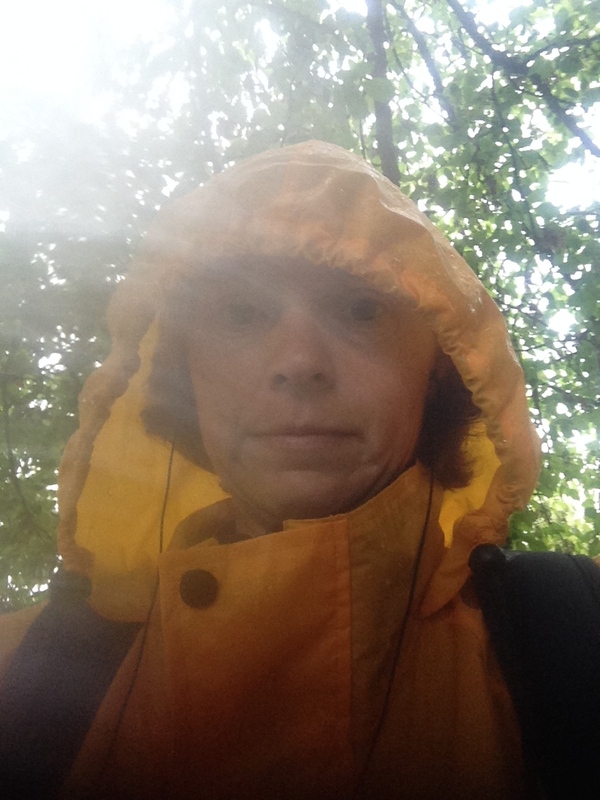 Waterproof on, and I plodded on!! Now as I walked the rain came and went. I had my instructions on Google Maps, but every time I looked at them the rain hit the screen and made it move. This isn’t good when you need to know where you’re going. But I soldiered on and then the wind started to blow rather strongly. This wasn’t going to put me off after all I create enough wind myself. It then came to the point where I had to cross a rather busy main road and then use some rather narrow roads. Google Maps had suddenly gone from my phone. Where it had gone I have no idea. Now I’m rather lost without it, and as I was trying to re install it there were a couple of flashes of lightning and a rather large rumble of thunder and then the heavens really opened. Oh my!! There I was not knowing where I could shelter, with a storms brewing over head. So after about an hour and a half of walking I phone Mark to come and get me. I found a petrol station to shelter in as I waited for him to arrive. A massive thank you to the men in the petrol station who didn’t mind a very wet bedraggled figure making their floor very wet. When I got home I went straight in a lovely hot bath with a currant bun and a cup of tea. Now after lunch and a little nap I feel much better. The sun’s shining now, but I’m not going out for a walk now it’s too late. I’ll try that walk another time. A very appropriate t-shirt for a very appropriate day’s weather. This entry was posted in Uncategorized and tagged claire's allotment, Google Maps, National Trust, Nymans, Shine Walk. Bookmark the permalink. 8 Responses to A weekend of two halves!! What the cat dragged in! Had to look up the definition of tombola though. What the cat dragged in…and the dog and any other animal you can think of. 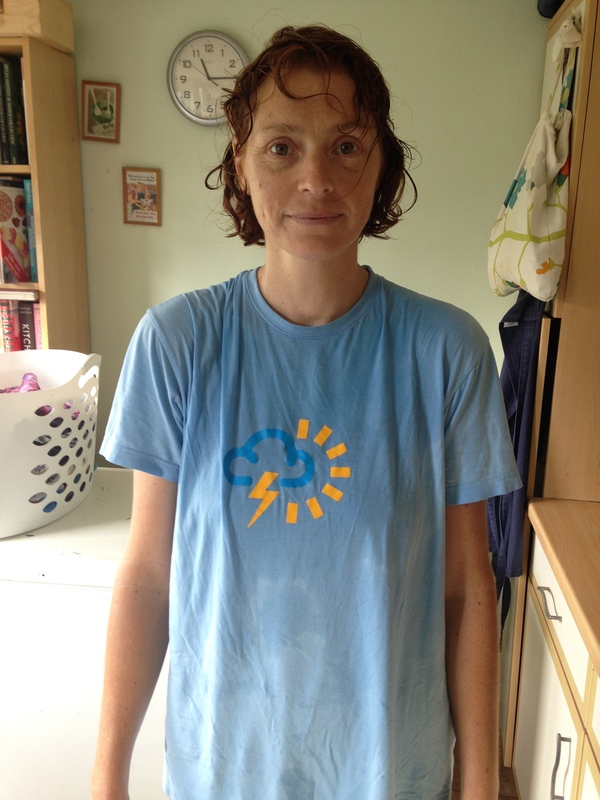 I was very, very wet and cold when I got home. A hot bath was very welcome. Yes indeed – a weekend of contrasting weather. It’s still horrid outside my house. More like February than August. A pity your couldn’t finish your walk. It’s such a pain when your phone plays up as well! We got some sun in the afternoon, but by then it was too late to walk anywhere else, and I didn’t want to get caught out again. I have no idea where Google Maps went, but I’ve downloaded the app again, so I should be ok next time. I’ll attempt the walk to Nymans again, but after we come back from holiday. Looking back at what I did, I think it would have been more sensible to have stayed at home, but don’t tell anyone that.